I inherited my passion for making cakes from my late grandmother Betty Rogers. She made all of the decorated desserts for our families weddings and birthdays and although I haven't quite graduated to wedding cakes yet I know she would be proud of what I have done so far! My best friends kids always get excited around their birthday as they know they can choose ANY sweet creation they want. So far this has been relatively easy with princess cakes and numbers etc. This year my friends son took it to the next level.. he wanted a Finn McMissile (from Cars 2) and there was no amount of persuading him otherwise! So.. 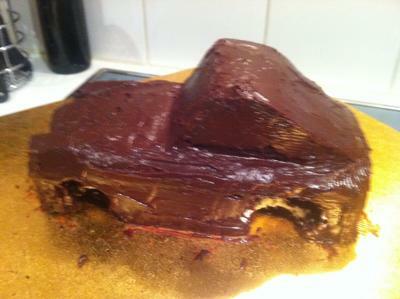 I had never done a car cake before and to be honest I was terrified! It looked so hard..!I began by researching as many different pics from as many different angles as I could find. Once I had a good feel for the basic shape and the additions (mirrors, grills etc. I call them 'accessories') I began. The cake was a staple chocolate recipe that I use and I baked it in two loaf tins. I stacked both layers together with cream layered in in between(I find with the sweetness of the torte it's a nice balance to have unsweetened cream and it helps keep it moist). 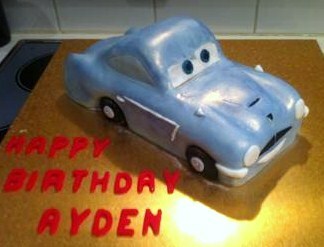 Once the basic shape was carved I used some of the left overs as 'padding' under the fondant, this was to enhance some of the features of the car such as the fins and the contours on the bonnet. Once this was complete the whole thing was covered in chocolate ganache (see picture) and then a layer fondant which I had very lightly coloured blue (almost pale baby blue). After the fondant was rolled on, using a wide brush I gently brushed on a blue shimmer all over the fondant to give the car its blue metallic sheen. I cut out the eyes, painted on the detail and carefully attached all of the accessories with fondant glue. For strong colours like black, red or yellow I find it is always much quicker to use pre coloured Bakels fondant or similar. 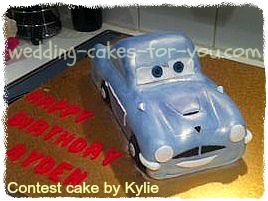 It saves a lot of time and effort trying to get fondant to such a vibrant colour - trust me it's a good investment! If you wrap it carefully in a couple of layers of cling and then foil, THEN put it in a airtight container. It should keep for ages. The trick is not letting the air get to it and it can continue to be reused as you need. There are no words to describe little Aiden's face when we presented this to him! I have never seen a little boy get SO excited! I was worth the MANY hours put into it. That cake is amazing!! You are very talented! Cars are HARD to do!! I have tried two before, they slightly resembled cars if you tilted your head to the side and squinted!! Incredible work! Your cake is fabulous.. I have done few cars myself and know the frustration of getting to go just right.. Your Grandmother would be proud.. absolutely wonderful..